← Contest – Enter Now to win a HDX Dragon! Sharon Crawford from Bellingham WA, congratulations. I know you will enjoy the HDX Dragon. https://digitalmediaphile.wordpress.com/2008/01/01/is-this-your-lucky-day/ (or for those of you that entered from my older blog where the contest was mirrored, this URL was also correct. After removing/deleting entries above that didn’t meet the qualifications, I sorted the correct entries oldest (first in) to oldest and exported to Excel. 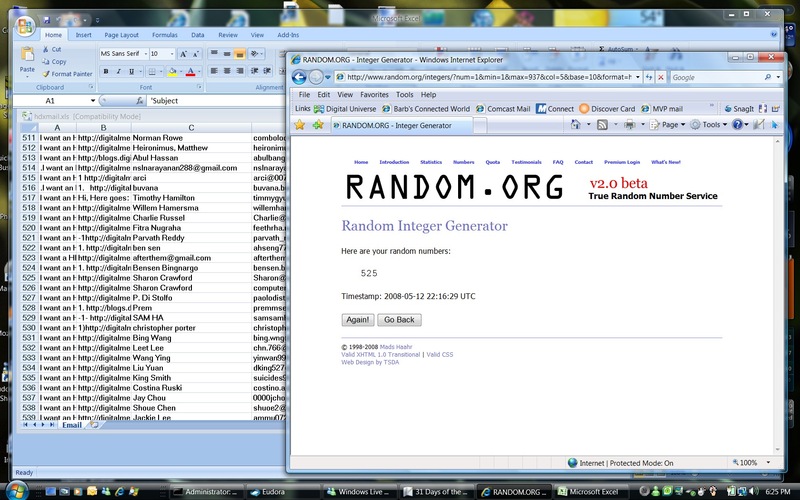 Then I visited www.random.org and put everyone’s fate in their hands. Click the image below for a full-size screen shot. 403 entrants did not follow directions and were eliminated from the contest. Issues with these entries included not using the correct subject line, “I want a HDX Dragon” or “I want an HDX Dragon” (a vs an being a grammar issue). And some folks that didn’t do the treasure hunt but simply sent their contact info or told me a sob story. And a few that included images and graphics where I specifically stated “no images or stationery”. Additionally, I was very clear, one entry per email address. You could enter from multiple email addresses, but not from the same one more than once. Sorry if you were in this category of disqualified entries. Other contests are still running. Click here for a list!. This entry was posted in 31 Days of the Dragon, Contest, Dream Notebook, HDX Dragon. Bookmark the permalink.